Sandy Banks wants to know if there is an equivalent "bah, humbug" expression for Halloween. So would I. I hate sugar holidays, especially ones that fall a mere days before Iris' birthday. Try preparing to throw a kid's birthday party in the week leading up to Halloween. Line up with the crowds of people, trying to enter the party supply stores. Don't say that we should have prepared in advance. You try bugging people to get their the RSVPs in by an early deadline. Iris pestered me about decorating for Halloween. I told her that maybe we can arrange for her to be adopted by our next door neighbors who decorate for all the holidays. She didn't find it funny. Store bought costumes are so cheaply made and tacky, despite their inflated prices. Plus, I worry about exploitation. (This is no idle worry as the recent Gap fiasco proved.) This year, I dispensed with all guilt. I bought Iris a flimsy witch costume from a dance supply store in Westwood. I also bought her a long-sleeved black t-shirt to wear underneath it for warmth. This year, I will live vicariously by reading the blog of a woman who is sewing a fairy costume inspired by Madeleine Vionnet and the book, “In the Realm of the Never Fairies, The Secret World of Pixie Hollow”. She does breathtakingly lovely work. She is hand painting silk petals for the dress! Click next at the bottom of each post. So far, she has written 4 posts in the thread. Instead of throwing a big party, Iris will go to Disneyland with 3 of her best friends on Sunday. Iris will bring cupcakes to her soccer game on Saturday, her birthday; it was our turn to bring snacks anyway. There will be no goodie bags! Instead of cupcakes in her classroom, I asked her teacher if she would prefer a visit from Kathy's Critters (aka the Bug Lady). Kathy will bring her insect and reptile zoo to her classroom, point out which ones are native and which are exotic, and discuss characteristics that make natives particularly well-adapted for our locale. There will be no sugar in the classroom and Kathy will wrap up just in time for lunch. I need only write a check for the tax-deductible cost. Well, the weekend is a little more hectic than I let on. We are hosting 4 family members in town for Iris' birthday. We will hold some sort of family dinner on Saturday night. Iris has informed us what kind of cake she expects. Meanwhile, back at the ranch, I caught the cold going around. That puts me off my drug regimen once again. In addition, I lost my voice. About twice a year, I catch an infection bad enough to set off a cascade of auto-immune symptoms in my throat. It would be laryngitis and a sore throat in a normal person, but I am not normal. It usually takes 3 weeks, 21 days (I keep track), before I can talk again. Once, my throat swelled up so badly that I had to go in for IV fluids, antibiotics and powerful painkillers. The doctor said I was this close from asphyxiation. Of course I am on the schedule to speak at an upcoming satellite health meeting in 3 weeks. Gotta rest. On the bright side, silence actually makes me more productive at work. Today, I kick back in bed with tea with honey and a good book. Guess what we did yesterday? 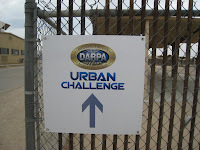 We attended the DARPA Urban Challenge semi-finals. Of course, we went to cheer on our hometown robot, Golem 3. The finals take place over Iris' birthday weekend so we decided to attend the semi-finals instead. That's the evil Discovery Channel crew interviewing the team. Well, the crew members might not be personally evil, but they are supposed to be making a documentary. They are not supposed to write dialog in order to fit their storyline and force the "cast members" to read it. From what I read, every "reality" show does that. So the crew is no more or less evil than any other crew. Enough said. Just don't believe the "personal drama and conflict" you see on their show. During the semi-finals, the robots attempt to navigate 3 courses. Before each course, like the minute before the start, the teams are given a USB memory stick with "the mission". The mission includes everything the robots need to know about the course and route. That means they know their expected course, have a map of the area, and know where the stop signs are, even though the signs are not posted. The top scorers, up to 20 robots, advance to the finals. If you had a bunch of robotic cars driving around, would you want to put them out in traffic with "civilians"? The smart people at DARPA bought 47 Ford Tauruses, stripped their interiors and put full NASCAR roll bars and protective devices inside. 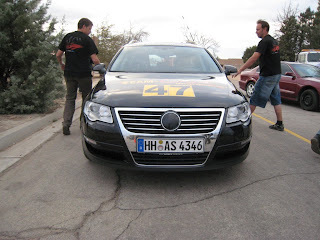 The cars are driven by professional off-road race drivers. Parked cars are junkers bought and placed around the course. I have never watched NASCAR, either in person or on TV. 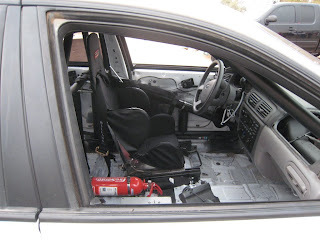 In case there is another person in the US who also has not, here are interior shots of the cars. 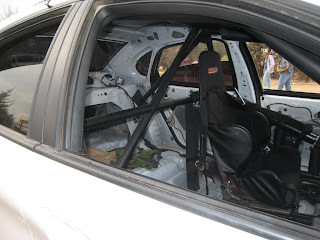 The back showing the roll cage. Course A sounds simple. The robot has to merge into traffic and drive around the course as many times as they can in 45 minutes. 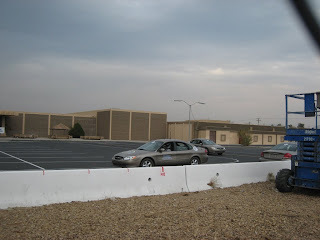 In course B, the cars enter a course that is not viewable by the spectators or the participants. The cars go in, but (with two exceptions) they don't come out. No wonder it was nicknamed "the maze". Team Lux, below, got through 80% of the course before time ran out. I congratulated them on a good showing. They responded in typical German manner. Here they enter "the maze". The commentator said that the car is the baby of the woman in black. I told Iris it was the woman's brainchild. But a quick look at the Team Lux website says that she has no technical involvement. She is the marketing chick, a booth babe. Oh, well, I don't have to tell Iris that. The Team Lux robot is really slick. Their lidar system is hidden integrated below the headlamps. Their lidar system is used in many of the other robots in the competition. 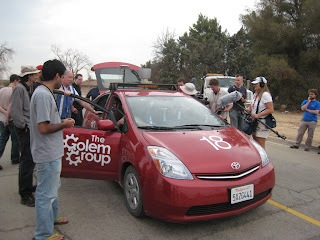 Golem 3 also has a lidar system, but externally mounted. It is a relatively small, light and maneuverable robot. At the other extreme, you have the MIT robot. It is the most heavily instrumented robot in the competition and has the most computational power under its hood. There are 40 "cores" inside of that SUV. Can you imagine the kind of cooling system required for that? Note that the windows are closed and they are driving around in the desert. Everyone likes the Cajunbots. I like any team that carries art around to a robot competition. Iris was more impressed with having a wide open area to play with and a big stick. We don't see much sky at our house. I miss big sky views. We close with Golem 3 successfully navigating a 4-way stop sign in course C. That's the one where they circumnavigate a residential subdivision. It stops short of the sign and then proceeds to the sign. I think its lidar system sensed some dust kicked up by a gust of wind. Twice, I felt a gust of wind and saw dust swirl. Each time, Golem 3 stopped and proceeded until the dust ahead cleared. Golem 3 got stuck at the same place as the Ford/Delphi robot just before it. On the third lap, those sneaky DARPA folks put up cones near a curve in the road; the robots were supposed to know that they needed to make a U-turn and go around that section of the subdivision. Most robots failed at that point. After a restart, the Ford group was able to make the U-turn, but then ran into a barrier. Golem 3 just stopped, even after they restarted the computer. It will be a long night two weeks of coding for all the teams. You can see more on my uploaded videos page. 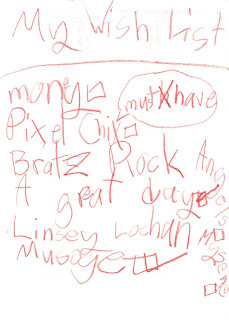 Iris' birthday is less than a week away and she has written up a wishlist. I didn't have a problem with that until I read the list. The list is probably not that unique (except for the massage). I was crestfallen to see so may things associated with web advertising on the list. She has discovered children's websites with a vengeance. It borders upon an addiction. Like I previously wrote in Things my mother never taught me, I have mixed feelings about all the commercial messages she receives on the web. 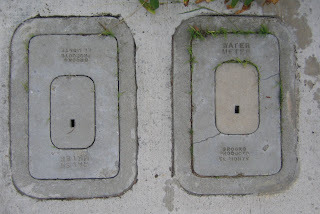 It is hard to stop them without pulling the plug on internet connectivity at home. Kids exchange information in the schoolyard about website games and urls. She can type in her own urls now. She got frustrated because I wouldn't let her register for some sites which I found too commercial or taught messages that I didn't like. She found me too heavy-handed and she registers for websites without asking for permission now. She said that she didn't want to be the only kid in the school yard who couldn't talk about the games (much like I was the only kid who couldn't talk about last night's TV shows because my parents didn't let me watch). Moreover, unless we lock the keyboard (even when we step away for one moment), she walks in and commandeers the computer to head straight for one of these websites. It is totally exasperating. Once, when the babysitter thought she had put her to bed, we found that she had snuck out of her room and taken the laptop to bed with her. She had formed a tent under her bedcovers and was playing some internet game. She threw such a fit, I had to unplug the modem to get her to relinquish the laptop. It is time to run over the the Apple store in Manhattan Beach and buy OS X Leopard. It has parental controls that allow us to limit the amount of minutes she is on the computer, variable for weekdays and weekends. It also gives us a list of websites she visited. I wonder if it will also let me limit time spent at each particular website? After all, who knows what kind of person she will meet at Club Penguin? She could be playing with Caitlin Flanagan for all I know. Mark ran into similar problems restricting her TV time. Our TV allows us to put parental controls, but it assumes that we want to limit stations other than G-rated ones. Those are the ones that she is interested in and we want to limit! Sigh. Mark had to tediously program in parental locks on all the children's networks one by one. Our TV setup has become so complicated, I have watched it only once in the last 3 months. Speaking of the ghosts among us the recent fires have illuminated some of our dirty laundry. We like to keep our insatiable need for cheap, exploitable labor and throwaway people neatly hidden. The NY Times wrote about how the Glare of Fires Pulls Migrants From Shadows. Ms. Trujillo and others who help the immigrants said they saw several out in the fields as the fires approached and ash fell on them. She said many were afraid to lose their (agricultural) jobs. Migrants hide in the canyons at the urban-wildland interface. It appears that many (perhaps most) of the fatalities last week were migrants burned alive in their hiding places. Their remains are being found as the fires are slowly conquered. Also don't miss another article, Rethinking Fire Policy in the Tinderbox. Here's a graphic from the story. People outside this region are often not aware that LA is a broad basin ringed by mountain ranges. The basin is built out. The growth has largely been in canyons or in the mountains, at the urban-wildland interface (shown in yellow). The only reason that LA county's percentage is not as high as those of neighboring counties is because of urban infill developments such as the townhouse I call home. I have mixed feelings about urban infill. I am collecting photos and other supporting documentation for a long post later. You may want to visit Volker Radeloff's website. He collected the land category data for the map above. 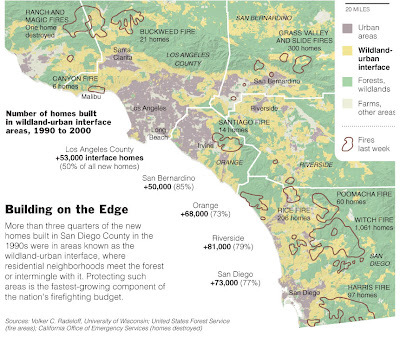 His website has a link to the paper, The Wildland Urban Interface in the United States. Coincidentally (or maybe not), Radeloff and Yi-Fu Tuan are both at University of Wisconsin, Madison. Tuan writes short essays in "Dear Colleague" format. I don't always agree with him, but I enjoy reading him from time to time. When I reread him, I discover thoughts and ideas that I didn't see upon earlier reading. I highly recommend his website! I found this in his archives about the difference between science and magic. Magic is knowledge and knowledge is power. Magic is full of esoteric knowledge, backed by test tubes, burners, and bubbling liquids, the end of which is power—that is, the ability to change the world or navigate effectively in it. In the sixteenth century came science, toted with great vigor by Francis Bacon. To him, science and not magic is knowledge and power. In the end, as we all know, science displaced magic, not because its knowledge is more esoteric or because it has fancier test tubes or because it is backed by a more prestigious social network, but because it has triumphed in the one area that truly matters to people—power. At the end of this particular essay, he cautions against studying systems just so we can mess with change them. Magic predates science. But so did something else—wisdom. Wisdom strove for knowledge about reality, but not so much to gain mastery over it as to enable humans to adapt. Ecological science is thus more like ancient wisdom than it is like modern, technology-driven science. The word "community," which frequently crops up in ecology, suggests that one studies it not to control or change it to something better, but rather the opposite, to preserve or restore it. When "human" is added to ecology, as in human ecology, the word "community" is retained, and with such retention, the implied conservative posture of wisdom. Political ecology, on the other hand, is more dynamic. Implied is a need to alter the socio-political structure of a community. Alter to what? Do ecologists say that a mangrove swamp or a tropical rainforest ought to be something ecologically better? No. But political ecologists do say of any existent human community that, yes, it can and ought to be better. Ecology is like old-fashioned wisdom in that it studies what exists and how creatures ought to adjust and adapt. By comparison, political ecology is more power driven, and is in this regard like modern science. On the other hand, the power it interests itself in is not physical power, like the ability to throw things, but rather socio-political power. So what is political ecology? A science, a wisdom, an ideology? All of the above, none of the above? Since we bought our blue Prius, we have been noticing them everywhere. In fact, there is another on our block, 3 houses away. There is another one at our workplace. Half the families of Iris' circle of a half dozen playmates have identical blue Priuses. See the photo at the camp bus stop above. At work, I sometimes wander around the vast parking structure and lot, looking for my car. (Mark bicycles in most days and often takes the car out at lunch for errands. He doesn't always tell me where he left it.) I have mistaken the other blue Prius for mine, walked all the way across the parking lot and then discovered it was the wrong car. It is easy to be faked out; the other blue Prius has the same booster seat, but in a different color. That is not evident until I get right up next to it and the door doesn't automatically unlock for the smart key in my purse. Last night, I found out who owned the other blue Prius at work. I had to smile. They work downstairs from me and sent their two kids to the same day care center that Iris attended for 3.5 years. It was the same daycare center where I met the other 3 blue Prius owners. (I count the family that sold us their blue Prius when they moved across the country.) Of course their son, the same age as Iris, has the same booster seat. 6 families, one daycare center, and 5 blue Priuses. I better send them email to let them know that I am not stalking them, I just want to minimize the time it takes me to find the car. I heard one commentator say that we don't really meet people by chance any more. We think we do, but we meet people who share our values and interests because of the places we hang out. Mothers who meet at daycare centers bond because we already had something in common by virtue of selecting that daycare center. Because we can afford this particular center, we have to have a certain level of income and education. The location of this center implies that we live or work nearby; housing segregation by class and income is commonplace. This center charges about as much as one of LA's cheaper (usually undocumented with little or no English) nannies for the same amount of hours. The fact that we chose the center over one on one care in our homes says something about our values. We are fine. Mark's parents in San Diego are fine. The current fires are farther from them than in 2003. The smoke level at our house finally became tolerable this morning. My breathing is less ragged now. There was a bit of coastal fog that precipitated out much of the fine particles in the air. I am even hanging laundry outside today. The LA county fires are mostly out. The San Diego fires still pose a danger. Go to the KPBS website for the latest news and fire maps for SD. 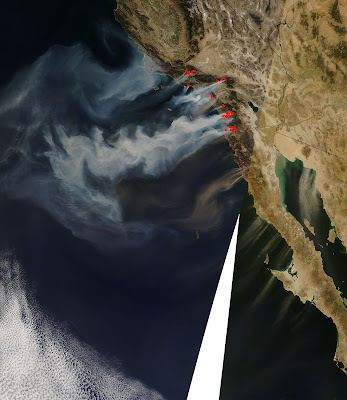 This image of the wildfires in southern California was taken by the NASA Terra satellite during this afternoon's overpass. I am not sure if the plumes in northern Mexico are dust or smoke. The color shift occurs when images from two satellite overpasses are stitched together. Areas which are very bright in the infrared (hotspots) are marked in red. The largest and waviest plume comes from the Witch Fire in Poway. The subset data has a slight time delay. 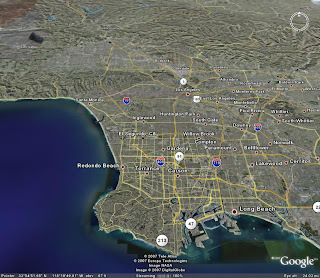 For the latest imagery, use the Near Real-time Imagery Browser page. Hint: Aura flies overhead at roughly 1:30 local time. Convert your local time to UTC time to obtain an approximate time to browse first. Then go a little earlier or later until you find what you want. Remember that visible imagery will be available during the early afternoon overpass but not the post midnight one. The CIMSS Satellite Blog shows an animation of smoke plumes seen from the GOES (geostationary) satellite. It is kind of mesmerizing to see the smoke plumes undulate. Last week, a huge chain reaction occurred in a tunnel through "the grapevine", a mountainous section of interstate highway 5, connecting Los Angeles to all points north. At least 9 people are still unaccounted for. Why? Two men and a 6-year-old boy died in the 1,500-degree inferno that engulfed 30 big rigs and one passenger vehicle. Ten people were treated for mild and moderate injuries, and 10 others escaped unharmed. That left nine vehicles with drivers, and possibly passengers, unaccounted for. California Highway Patrol investigators said they were confident only three people died. "We have no idea" what became of those who have not been in touch with authorities, said CHP Assistant Chief Warren Stanley on Monday. I have an idea why. Maybe these people were doing something that they weren't supposed to be doing? Like driving uninsured? Like being someplace that they weren't supposed to be? Statistically, out of 31 vehicles, how many will be uninsured in LA? Some people have pegged the percentage of uninsured drivers at 25%. But these were mainly big rigs. Surely they were insured? Maybe not. Have you been following the stories about implementing pollution controls on the diesel trucks at the harbors? The truckers are all against it, citing how they were barely making it. I was surprised to learn how little they earn as independent contractors. In fact, if they get stuck in traffic and burn up a lot of fuel, they can earn next to nothing for a night of waiting and driving. Who would work under those conditions? Those interviewed were all recent immigrants who had few other job choices. Hmm, maybe they don't want to be found. After all, what could they possibly gain from coming forward? What can they lose? I know some people find government regulation intrusive, but I want to know with whom I am sharing the roads. Are they well-trained? Licensed? Insured? Alert? Fairly compensated? Are their vehicles safe? The wind abruptly switched on and changed directions yesterday evening. The dewpoint plumeted. Look at this nearby (uncalibrated) personal weather station. Today, the dewpoint dropped even lower; it is currently at -4 °C. Is it any wonder that Malibu is on fire again? Actually, all of southern California appears to be on fire. See this map of current SoCal fires. When I went out today, my eyes stung from all the smoke. The LA Times has an informative flash animation showing that Fire is a river that runs uphill. I noticed with dismay that there are a bunch of fires in the vicinity of Cindy Rinne's home. Four years ago, her family lost almost everything in a wildfire that took out hundreds of homes. She grabbed her art quilts and her husband grabbed her Bernina. Her entire stash was wiped out. Yet, life goes on and she is continuing to create. There are also a bunch of fires near Victorville. 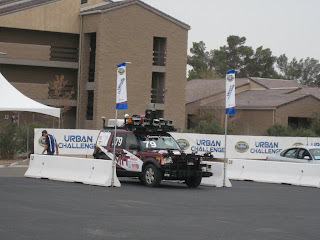 I hope they are contained before the DARPA Urban Challenge semifinals next week. We are going to cheer The Golem Group on. Their vehicle is a souped up Prius. How can we not cheer for them? I started this yesterday at Cindy Rinne's Plants, Seeds and Roots workshop. It was a small class and we had a blast. She had us start by spreading fabric out on the floor so that we can see what works and what doesn't from a distance. Then she taught us a bunch of techniques for painting, stamping and constructing smaller embellished segments. After lunch, Cindy set us free to meander. I gravitated towards the paints and inks. Note those round, nearly perfect circles. I did that freehand. Cindy was trained as a painter and she brought to class some really good paint brushes. Good tools make the job so much easier. I noted down the specs of the brushes so I can buy them. Stuff diet or not, I must have them. 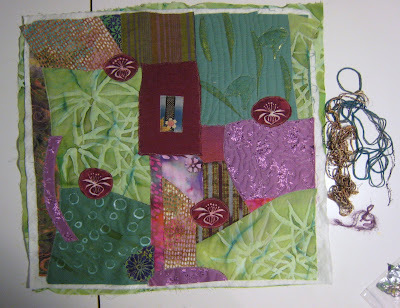 When I returned to my station to begin cutting and layering fabrics, I had trouble with the composition. Cindy makes it look so easy during her demonstrations, but it really took some thought on my part. Once I had the courage to work with smaller pieces, it became easier. Today, I set up my sewing machine's BSR (Bernina Stitch Regulator) foot and stitched down all the (raw-edged) pieces. Cindy did all her demo sewing free motion with a darning foot. Even with BSR, I would have benefited from using a walking foot on the straight parts. Eventually, I became more used to the BSR. In fact, I even stippled a couple of the patches. I will let you click on the photo above to see if I was successful. Cindy uses beads and yarns and all sorts of embellishments. I selected a few yarns from the bags she brought to class, but am not sure if I will use them. I am not sure if that is me. She also serges her edges and then covers the serged edges with trim. I would like work in such a free style. ...must resist the urge to do mitered hand-sewn binding... Or maybe not. Iris finished reading Harry Potter and the Deathly Hallows minutes ago. There was much hooting and hollering in this house. #7 took her a little longer than #6, which she read in four nights. James Watson really stuck his foot in his mouth. Much ink and pixels has been spilled about what he allegedly said and meant (he says he was misquoted or quoted out of context). Even if he did say the quotes in the Sunday Times, I think the professional pundits are missing something important. A test score gap is not the same thing as an intelligence gap. On what basis do we believe that these tests actually measure "intelligence"? What is intelligence anyway and is it measureable? Why blame the people who score low and not the test makers? When a professor at Berkeley gave an exam in which the scores were mostly clustered around a lower point than he usually aimed for, he apologized to the class. He said that it showed he had not taught us well, and he had not designed the test well. We recovered some of the material which the class had struggled with in the exam. Then he wrote another exam and had several graduate students take the exam to make sure that the wording on the second test was clear. After refinement, he adminstered the second test to the undergraduates. What makes an exam good in his eyes? First, it should cover understanding of the material. Second, he believed that the test should be that happy medium of difficulty that created a spread in the test scores. If the scores were all clustered around 30-40%, he couldn't sort the strong from the weak students. He aimed for a Gaussian (aka normal aka bell curve) distribution with an average of 70% and about 10% of the class above 90%. That got me thinking about exams as a reflection of the test maker instead of the test takers. If a test does not sufficiently spread out the scores, does it mean that the test is not sufficiently exploring the differences between the test takers? Have you ever read a movie or book review which said that the female characters were "flat"? That is, the male writer or movie maker had too weak of an understanding of females to create three-dimensional female characters? Why isn't the same criticism leveled at standardized test makers that are flattening out the differences between females in their scoring schema? The Atlantic Monthly has run several excellent articles about the history and culture of testing. Read The Structure of Success, The Great Sorting and Lemann on Testing. Historically, the tests were designed by white men for other white men. If non-whites and females do not score as well as white men, is that the fault of the test-takers or the test-makers? Recall that, not so long ago, people used to say that Asians are genetically inferior because we did not score as well as whites on IQ tests. A generation later, Asians outscore whites. Did our genetics change in just one generation? No, the tests were translated so we could take the tests in our native languages. ;-) OK, there were some other changes in nutrition, schooling and economic gains. I have written quite a bit about school testing under the Education tag. In particular, Who's keeping score and why? has many links about school testing. * One argument for the GPA difference is that women more frequently major in the humanities than in engineering or the sciences. Average GPAs in the humanities are significantly higher than in science and engineering. Well, the differences in GPA persist even when controlled for differences in average GPA between majors. In fact, a MIT study in the 1980s showed that, for MIT students with the same high school GPA to earn the same MIT GPA, the boy needed to score 150 points higher on the SAT. It is safe to assume that the girls (and boys) at MIT are all majoring in science and engineering. Back to why metrics can lead us astray. Let's look at college rankings. It is October which means it is time to rank colleges. When I look at their metrics, I can't help but think about the ways that higher education has changed in the US in the last twenty years or so since ranking mania hit. Look at the methodology for the US News and World Reports rankings. Student selectivity accounts for 15% of the score. The more applicants schools attract, the more they can reject, making them appear more selective. 25-75 percentile SAT scores also are counted. That is why schools are increasingly obsessed with applicants' SAT scores. Many schools are buying them by giving "merit" scholarships to students with high SAT scores. Thus, a test score that correlates most highly with parental income is being used as a basis to reward students who are least likely to have financial barriers to college. This reduces the amount available for need-based financial aid, further increasing the affordability gap for students from low and middle income families. Faculty resources account for another 20% of the score. The two largest factors are faculty compensation (35% of the 20%) and class size (30% of the 20%). Percent full-time faculty only account for 5% of the 20%. A school can increase their ranking by using more part-time non-tenure track faculty at slave wages to bring down their class sizes. They can use part of that cost savings to increase the amount they pay their "super-star" faculty that perform research and teach very little. Voila! They have become a "better school". No wonder the nationwide percentage of college faculty that is tenure track has fallen below 50%. Do part-time "freeway flyer" faculty teaching 2-3 classes at several schools provide a better experience for the students? It doesn't matter at all in this ranking system. The Big Picture The Atlantic Monthly covers college admissions in Fall 2004. We give in and go with the flow. So, if we hold such metrics in such contempt, why did we recently sign Iris up for a standardized test? We want to send her to the Center for Talented Youth camp next summer. 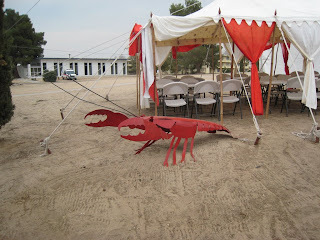 It is a camp for gifted children. We wanted her to be challenged intellectually and to meet other kids like herself. The only way for her to get into the program is for her to take one of several standardized "intelligence" tests and to score high. Can you believe that the application deadline for camp in June 2008 is December 1, 2007? I don't want to give the impression that I am against metrics in general. I spend my professional life exploring data and devising metrics to help pull out the important stories in the data. Because of my experiences, I have become acutely aware that poorly selected metrics can skew or miss the story. We need to be careful about the use of metrics. And, we should change the metrics now and then to stay one step ahead of those who would game the metrics. I must get to sleep. I am taking a class with Cindy Rinne tomorrow. Addendum: read Are Metrics Blinding Our Perception? I am not advocating using psychics over metrics. But I would like us to think a bit more carefully about what the metrics tell us. What are we really measuring? Are there alternate interpretations? 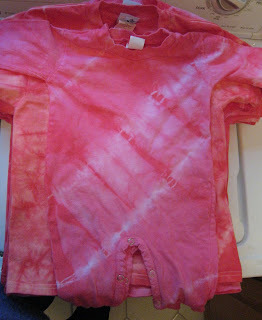 And a onesie for the teacher's baby due in January. Closeups. Top right and bottom left used Fire Red, top left and bottom right (Iris') used Sunrise Red. Sunrise Red was a yellow powder. When mixed with water, it turned red. However, it reverted back to yellow in the rubber band resist areas. 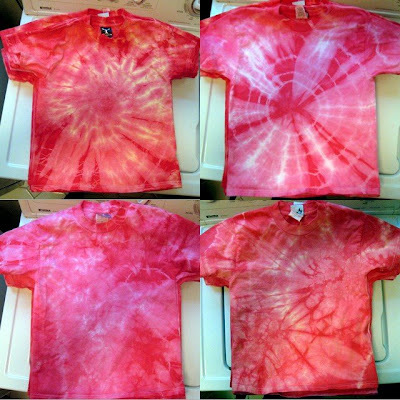 The surprise of tie-dye never fails to delight the eye. 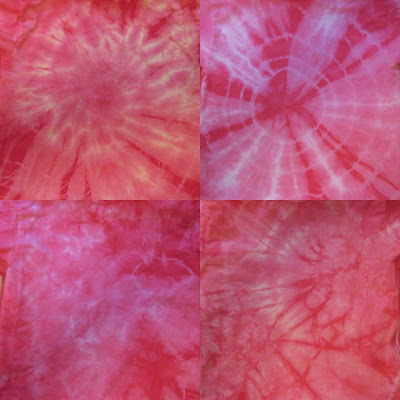 Another second grade teacher wants her class to tie-dye as well. Hmm, my back is killing me from hauling the buckets full of ziploc baggies, shirts and solutions. I better write up a project sheet for the teachers and helpers. When I get around to it, I will post it here as well . Like Maribeth said, duh. I learned to speak English in Kansas City. Although I have been all over, I spent most of my time in California-another region with a neutral accent. Walking my watershed, I saw plenty of signs of autumn. That means it is time to bring out the Aspen Leaf Scarf. Originally, I posted the free pattern. But, my LYS, the Slipt Stitch, asked if they could sell the pattern. 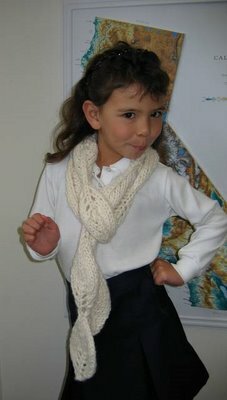 They can't sell what I am already giving away for free, so I took the pattern off my blog. However, I made a whopping $9 off that pattern; I better keep my day job. I would rather repost the pattern here and see many people enjoy their own Aspen Leaf Scarf. If you make the scarf, please leave a comment with a link to a picture of your scarf. And the usual stuff applies. You can use the pattern for personal use only; do not sell the scarf; do give credit to badmomgoodmom for the pattern-I am sensitive about my intellectual property. As my other patterns sell out at the Slipt Stitch, I will repost them here rather than restock the store. Check back periodically. Gauge: not essential, but super-bulky or 2 strands of worsted yarn held together and knit on size 15 needles make a ~ 4 ¼ inch wide leaf. To end, S2,K1,P2SSO and pull yarn through last stitch. The leaves will curl, just like real leaves do. S2,K1,P2SSO slip 2 stitches knitwise together (like you are starting a K2tog), knit 1 stitch, pass 2 slipped stitches over the knit stitch. This forms a centered double decrease. © 2006 badmomgoodmom, all rights reserved. 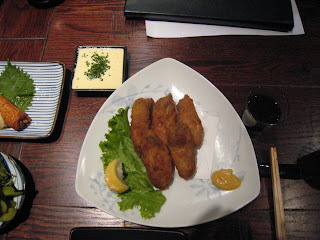 Years ago, I attended a lecture by a noted member of the "Deep Ecology Movement". I can't remember his name or all the things he talked about. But I do remember that he sounded much more reasonable than detractors of the movement had led me to expect. In his closing statement, he implored the audience to "walk your watershed". How can such a simple idea lead to a whole new way of seeing my relationship to the world? Today, on Blog Action Day, I would like to take you on a tour of my watershed. We begin with a familiar picture. Lucky urban dwellers don't have to think much about water. Clean, safe water just comes out of our taps. 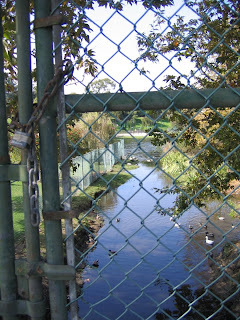 (I know that it is clean and safe because my water district encloses the results of water analysis with the bill.) The bill is paid with hardly a thought. It takes 1-2 hours of my salary to pay for a whole month's water for our household. Contrast that with the 5 hours per day a woman in sub-Saharan Africa might spend providing her family with water (which is not necessarily clean and safe). Where does our water come from? I live in a semi-arid region with about 15 million other humans. Once, there were wetlands which did provide water for a small human settlement and an estuary for wildlife. But the wetlands are mostly paved over now. 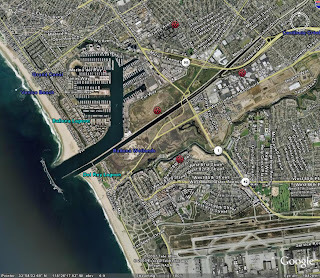 Ballona Wetlands used to cover over 2000 acres, but only about 800-1000 remain and much of that will disappear under the Playa Vista development which is being built now. 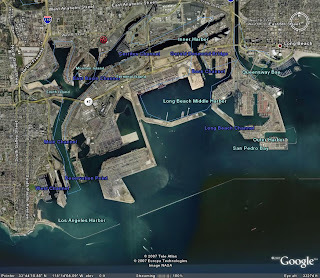 Another large wetland area became Los Angeles and Long Beach Harbors, two of the busiest, and most polluted, ports in the entire world. Our natural watershed can't provide sufficient water for the population here. 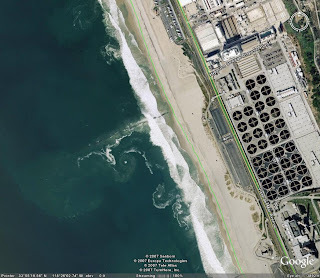 Read Revisiting ‘toilet to tap’ to learn how the Hyperion water treatment plant below provides recycled water to the beach cities. In the picture below, you can see some of the water that the Hyperion plant releases into the Santa Monica Bay. What you can't see is that treated waste water is also pumped into the aquifers from which part of my tap water is derived. But even recycling can't provide enough. We have to look much further to meet our voracious appetite for water. Some of it comes from the Colorado river even though we are hundreds of miles from the natural Colorado river watershed pictured below. 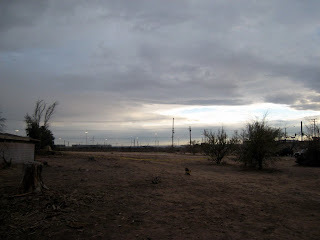 In fact, the Colorado River no longer flows to the sea. All of the water is used and reused until the river disappears in the desert. 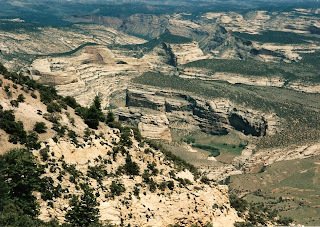 This favorite campsite is near the confluence of the Green and Yampa rivers, in Dinosaur National Monument. A few miles downstream, they will join the Colorado river. 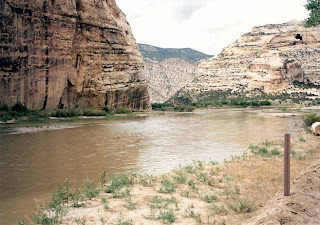 In the morning, we rode our mountain bikes on a jeep track along the Yampa Bench overlooking the Yampa river. 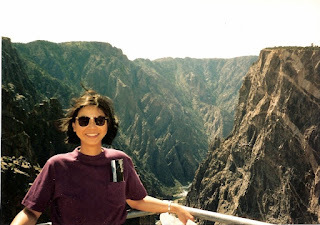 On another trip, we visited Black Canyon of the Gunnison, also in the Colorado river watershed. 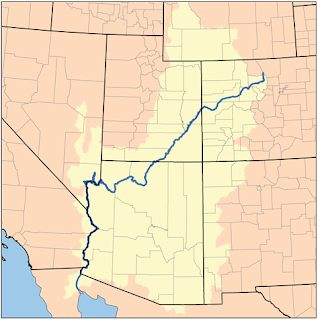 The Colorado river is a shared resource. We cannot take enough from it to satisfy our needs. We also tap the Owens valley watershed picture below. 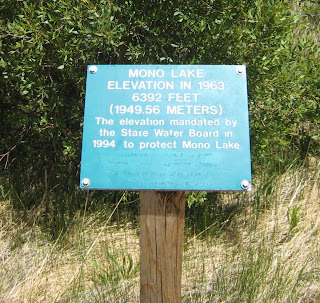 The extent of Mono lake used to be much bigger and this valley used to be much greener. 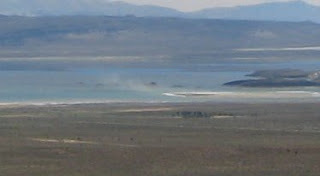 See the dust devil below from June 2007? Los Angeles lost a lawsuit because it diverted so much water from Mono Lake, that dust storms became common. This created unhealthful air quality for the people living in the Owens valley. Los Angeles did not live up to its past agreements. The water line agreed upon in a court settlement in 1994 is here. Doesn't look very wet here at all. 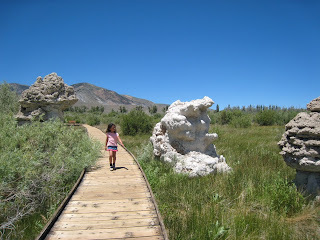 All of these tufa formations used to be underwater. If the agreement above were honored, many of them would be underwater again. 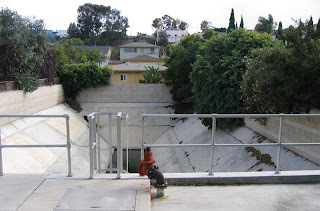 I walked my neighborhood today to show you my watershed up close. Our household sewage goes here. Note that I live in an urban infill townhouse. Two identical townhouses share a single lot, hence the two sewer lines. Storm runoff goes into a separate system which flows, untreated, into the ocean. 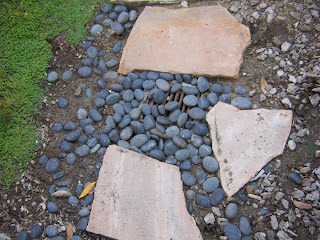 Here is our backyard storm drain. The storm drain in the front driveway. The storm drain by the street. 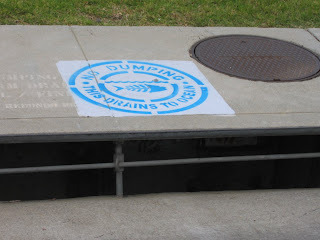 Note the graphic reminding us not to dump nasty things into the drain. A sign at the park tried to educate the populace. 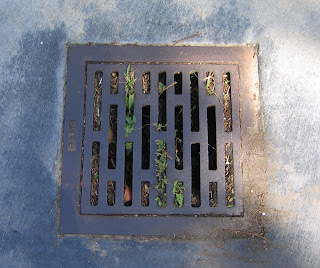 Some of the storm drains are above ground and attract wildlife. This ersatz creek flows into Polliwog Lake. Note that our recent rainfall caused the lake to overflow its concrete banks. The benches are not normally in the water. 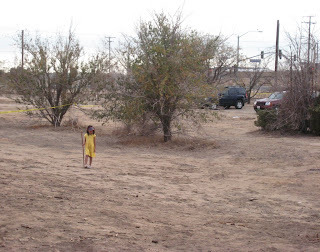 It is a sad fact that, around here, only low-lying areas are turned into parks. But at least Polliwog is a very attractive park. This catchment basin is not as attractive. It all ends up here. 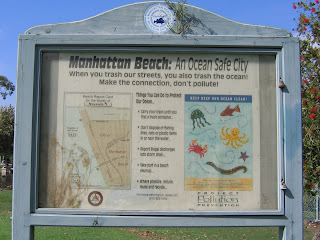 Read the environmental scorecard for the beaches. Which then rains back down. And so it goes ad infinitum. The global watershed is all connected. Take good care of your watershed. I couldn't resist this meme I saw on Dooney's World and Pea Soup. These are the top 106 books most often marked as "unread" by LibraryThing’s users. and those underlined are on my To Be Read list." I have started and not finished more books than this list would make it appear. With the green background of this template, it is difficult to distinguish between bolded letters and normal letters. Try temporarily increasing the font size of this page to make the distinction more obvious. Mark has been systematically going through his lifetime to be read list lately. It would be interesting to see his list. Tomorrow is Blog Action Day. 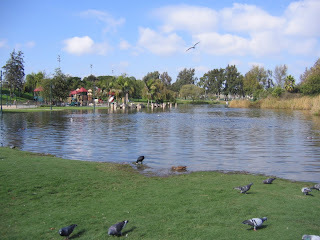 I am putting together a photo essay; I still need to take a few more photos today on my walk. Or maybe it is the happy dance. Our rain gauge held 0.9 inches (23 mm) of water this morning! Add that to the 0.5 inches in late September and those two storms resulted in roughly 50% of the total rainfall of the whole water year (counted July 1-June 30) prior to that. I feel like such a geek for blogging about small amounts of rain comparable to mere fog in other parts of the world. But, I noticed that Grandma Ann of Sitting Knitting and BAM of Breathing Treatment also blogged about the rainfall and gave their rain gauge readings. 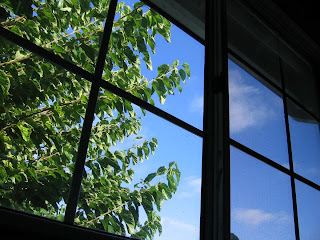 Don't miss the photos of the sunrise before the rain at Sitting Knitting. Actually, don't miss any of the photography over there. Mark and I mucked around in the yard today. We neglected it so during my last health setback. I had to trim back half our lemon tree due to an aphid infestation. We also trimmed quite a bit off the (healthy) bay laurel tree and the rosemary bush. I put the trimmings out by the sidewalk with a sign saying, "FREE Rosemary and Bay Leaves (but leave the basket here)". One lady actually took some Rosemary. I went into the kitchen to get a plastic bag for her. Maybe I will even knit tonight. My sister just bought another spinning wheel. She swears that she NEEDS them all, for different types of fibers. Yeah, that's right. I NEED all the stuff in my stash because they have different uses, too. The surf was up last Friday. Remember how placid it looked in the photo in Pleasure? Sure looks different in the video I took Friday, 5 October at lunch. Listen to the roar of the wind and watch the flapping of the palm fronds in the video. Look at the jet stream analysis (courtesy of the California Regional Weather Server). Ripping winds aloft usually mean big winds below. Big winds bring big waves. By the next morning, the water was considerably less choppy. Warning, this post is heavily image and calorie intensive. 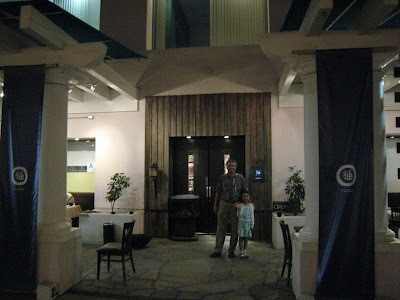 Mark and Iris took me to Yuzu in Old Town Torrance for my birthday. 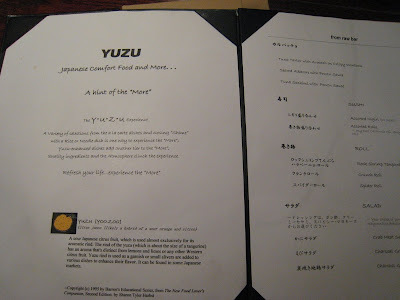 The charming menu doesn't translate well. The view from my seat. I love the willow and miniature rope light arrangement. 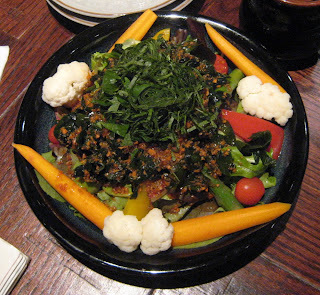 I ordered the "Japanese Salad" because I saw one delivered to a neighboring table. 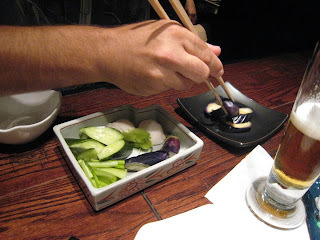 Mark says that the pickles taste like kosher garlic pickles-only made with Japanese eggplant and other vegetables you don't find in a kosher deli. We had to have the phat oysters again. 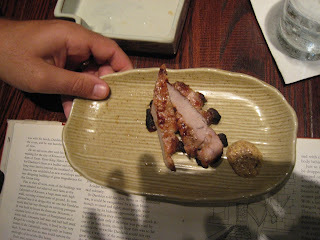 We also ordered the pork again. Iris loved this. 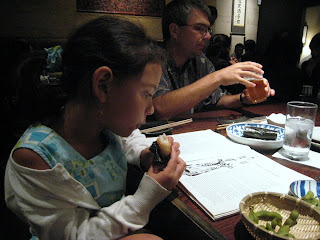 Iris was lured to Yuzu by the promise of gourmet rice balls. She seems to be enjoying the food and her book. 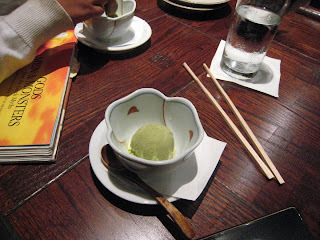 For my birthday, they sent us all green tea ice cream. 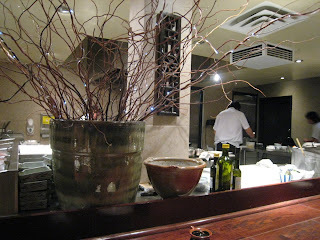 It was fabulous, but I missed the sesame ice cream we had on our first visit to Yuzu. The floors looked familiar and not familiar at the same time. Closer examination showed they are made of giant bamboo. 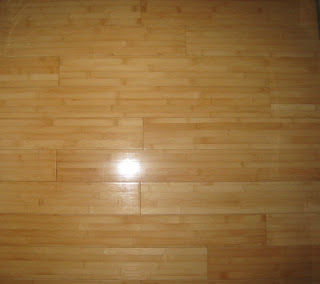 I have never seen bamboo planks like these before. 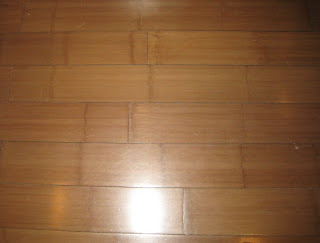 These are the bamboo planks you most commonly see. When we put bamboo in our bedroom 10 years ago, it was considered exotic. Now, every remodel you see in the LA Times requires bamboo. How quickly we went from green trendsetters to bourgeois bohemians. 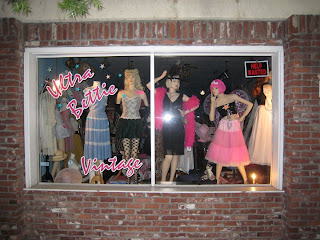 Old Town Torrance has an edgy feel that outsiders know nothing about. We like to keep it secret from the trendoids. 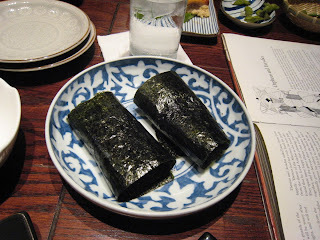 Read about our first and second visits to Yuzu in The past, deliciously present and Tofu and Toto.